On the day that Obinna’s village is savagely attacked by the rebel army and his father murdered, he witnesses violence beyond his imagination. Along with his older brother he finds himself thrown into a truck when the soldiers leave, to be shaped into an agent of horror  a child soldier. Marched through minefields and forced into battle, enduring a brutal daily existence, Obinna slowly works out which parts of himself to save and which to sacrifice in this world turned upside down. Majok Tulba fled war-torn South Sudan as a sixteen-year-old, and now lives in Sydney with his wife and children. He was awarded a NSW Premier’s CAL Literary Centre Fellowship, and is the founder and CEO of the charity Mother and Child Development Agency. 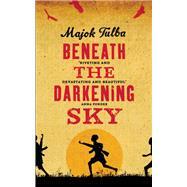 Beneath the Darkening Sky is Majok Tulba’s first novel, and announces the arrival of an important new African voice.